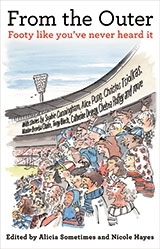 A celebration of our great game, From​ the Outer brings together 30 personal stories about Aussie Rules from unexpected voices: those who are female, Indigenous or gay; those with a disability, a foreign accent or even – perhaps most dubious of all – literary leanings. Some are closet fans, some are out and proud. Many are ground-breaking and revolutionary, shaking up the institution that has dominated cultural life in Melbourne, and much of Australia, for generations. Some are actively involved in the game, such as Leila Gurruwiwi, panellist on Australia’s first all-Indigenous footy show; Angela Pippos, one of Australia’s first female sports commentators; and Jason Tuazon-McCheyne, founder of the LGBTI supporter group the Purple Bombers. Others, like Christos Tsiolkas, Sophie Cunningham, Tony Birch and Alice Pung, share their poignant, passionate experiences as spectators and supporters.